The brachial plexus is a network of nerves that conducts signals from the spine to the shoulder, arm, and hand. Brachial plexus injuries are caused by damage to those nerves. Symptoms may include a limp or paralyzed arm, lack of muscle control in the arm, hand, or wrist, and lack of feeling or sensation in the arm or hand. 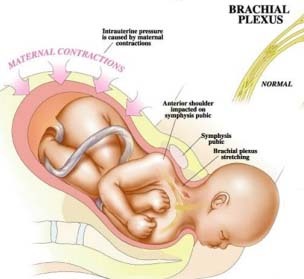 Although injuries can occur at any time, many brachial plexus injuries happen during birth: the baby’s shoulders may become impacted during the birth process causing the brachial plexus nerves to stretch or tear. There are four types of brachial plexus injuries: avulsion, the most severe type, in which the nerve is torn from the spine; rupture, in which the nerve is torn but not at the spinal attachment; neuroma, in which the nerve has tried to heal itself but scar tissue has grown around the injury, putting pressure on the injured nerve and preventing the nerve from conducting signals to the muscles; and neuropraxia or stretch, in which the nerve has been damaged but not torn. Neuropraxia is the most common type of brachial plexus injury. The NINDS conducts and supports research on injuries to organs and networks within the nervous system, such as the brachial plexus. Much of this research is aimed at finding ways to prevent and treat these disorders.